A velvety, sweet, and slightly vinegary tomato-base with real chunks of pineapple, onion, and peppers Vanee Sweet & Sour Sauce is a classic sauce for chicken, pork, meatballs or vegetables. Comes conveniently packed in half-gallon pour-friendly jugs; simply pour and serve. 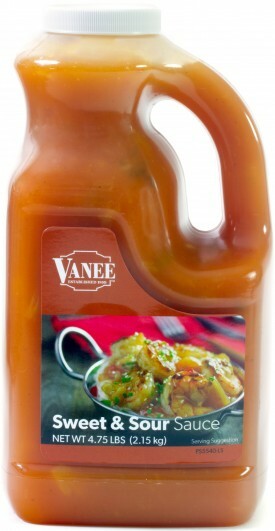 Vanee Sweet & Sour Sauce has no high fructose corn syrup. Each 64 oz jug has 31 x 1/4 cup servings, for a total of 124 servings per case. Great with meatballs, stir fry, chicken, and as a dipping sauce. Water, Pineapple (Pineapple, Pineapple Juice, Citric Acid), Sugar, Tomatoes (Contains Tomato Juice, Calcium Chloride, Citric Acid), Brown Sugar, Food Starch - Modified, Onions, Vinegar, Tomato Paste, Green Peppers, Salt, Natural Flavor, Corn Oil, Citric Acid, Onion Powder, Hydrolyzed Soy Protein, Spice, Garlic Powder, Corn Syrup Solids, Caramel Color.